We frequently see stories of MP’s taking up the cases of people imprisoned in foreign lands and their human rights. Hayes MP John McDonnell was very vocal over the case of Moazzam Begg, a man he claimed was wrongly imprisoned in Guantanamo Bay after being ‘picked up’ in Afghanistan and who, after his release, received a big compensation payout from HM Government. 5 OCT 2017 — 4 years ago I arrived in India and stood in the blistering heat for 6 hours outside the gates of Puzhal prison waiting for my Billy to finally be free and the injustice to end. Watching all those men walk free was the most humbling experience of my life. It put everything into perspective and helped me to appreciate the smallest things in my own life so much more. I spent the next few months in India with Billy, we had lost everything back home, but we had each other again. With not a care in the world we made sure we made the most of every single second we had together. We assumed that in a few weeks time he’d be free and we could return home-together and live the life we’d always dreamed of, the life we had before this horrific case took over our lives…We soon realised it wasn’t going to be that easy and our life would never be the same again. This is our story, a story I only thought belonged in Hollywood movies or fictional books. The past 4 years has been a living nightmare. What we have endured and faced I never believed possible. Billy was 33 when I dropped him at the airport to start the first day of his new job with Advanfort. I was just 23. We had only been together just 2 years, and during this time Billy had always worked in maritime security. He would go away for 2 or three months at a time. Billy often spoke about the dangers of his job. We spoke about kidnapping, drowning, being shot or killed. I wasn’t exactly happy about it, but I understood that was the dangers. It was hard to be apart for so long, But we knew we would spend the rest of our lives together and made the most of the time he would have at home. We were young, full of fun and had a carefree attitude to life. But On the 12th of October 2013 when a call came through from a representative of the company Billy was working for Advanfort all that was taken from us. We never did discuss the possibility of Billy being arrested while at work. Why would we? He was doing a legal, legitimate much needed job, providing security for seafarers in some of the most dangerous seas in the world. He had all his qualifications and certificates and had served nearly 10 years in the army. I had no clue where to begin helping Billy, and more worrying I didn’t understand why he was in prison. Naively I took no interest in politics or the news I had no idea where to turn in order to help Billy but knew I would need to act and learn fast. We got little information from Advanfort and what we did get were either lies or pacifiers. The FCO warned us off going public about our case, just to keep quiet and let the politicians talk behind closed doors as it could result in a worse outcome and could put our men’s freedom in jeopardy. We relied solely on the help from family, friends and charities like the Mission to Seafarers, HRAS and the Royal British Legion who have supported us every step of the way. It wasn’t long before we realised the situation was worsening. We were promised our men would be home before Christmas. I’ve lost count of how many times our case was up in court, and how many times we were promised that our men would be out within the week. It was mentally exhausting for the families involved, but for the men sat in prison without a visit from a lawyer, no information as to what was going on in court or between governments or even so much as a phone call home it was becoming a desperate situation. They were locked in a cell together in a foreign country millions of miles from home without a clue as to what was happening or why. With Christmas fast approaching and yet more failed attempts to release our men from prison we took the plunge and approached media to tell them of our story. One so unbelievable even the media wouldn’t print it and the news wouldn’t air it. It started to feel like everyone was against us and we weren’t just fighting the battle to free our men from prison, but we were also fighting against our own government who were failing to protect their citizens from one of the biggest miscarriage of justice our country has ever seen. Another against the company the men were working for – Advanfort who failed to fulfil their duty of care to their employees they completely abandoned them, even stopping their wages leaving the men and their families in great financial difficulty causing huge stress worry and anguish. Its not just our lives that have been devastated. On the 12th of October 2013, 35 innocent men were arrested on board the seaman guard ohio and the lives of 35 men and their families were catastrophically shattered and changed forever. Since that day our men have been subjected to complete and utter mental torture. Their Human rights have been violated time and time again, their innocence questioned and their freedom taken from them. In June 2014 the case was quashed I returned home from india where I was staying with Billy while he was on bail, I collected the welcome home banners and flags my mother had made in anticipation for his return, and started planning the biggest welcome home party the world had ever saw, leaving Billy to sort paperwork out and get a flight home. A few weeks of me being home we found out we were expecting our first child, it was massive mix of feelings Billy still wasn’t home but he had been proven innocent and soon he would be, my feelings turned to excitement love and I couldn’t wait for the next chapter of our lives.and Billy would be there by my side every step of the way. But On the 89th day of the 90 days the police had to appeal the quash decision,a appeal was lodged and our lives once again were torn to shreds….it simply could not be happening all over again. I was facing Billy returning to prison once again, and facing pregnancy alone. It was, if possible even more frightening and unbelievable than October 2013. We had beaten a corrupt police force in another country once, but could we do it again. On February 24th as I was flown by emergency air ambulance to hopefully welcome our first child into the world. Billy was sat alone by his phone in dingy hostel room in India waiting for any news at all as to if his child or myself would make it. Most men feel helpless at the birth of their children. But Billy was a million miles from home and could n’t even give me a cuddle and tell me everything was going to be ok. Something had gone wrong, I was losing blood and our baby’s heart beat had stopped. I was rushed onto a aeroplane alone when the helicopter couldn’t fly due to weather and I couldn’t even call billy to hear his voice or let him know what was happening. Thanks to the incredible hospital staff our beautiful boy was born, healthy and happy and we named him after his dad. It should have been the happiest day of our lives. Instead it was bittersweet. There I was holding the most incredible and beautiful baby I had ever saw in my life, But his father wasn’t there beside me. Billy couldn’t his Newborn son or thank the hospital staff, he couldn’t cut the chord or snap a picture on his phone of his family and upload it on social media like most new fathers do. Furthermore we had no idea when the day would come that he would finally meet his boy. What Billy went through that day it hard for anyone to comprehend or understand, but it’s a day he can never get back again. A day my little family can never relive. At that point Billy had been cleared of all charges the case was quashed and and he was free to go home. He should have been home. He should have been home for our first scan, and for the anti-natal classes, he should have been looking at prams, and building the nursery furniture with me. He should have been beside me when our son was born. But he was n’t. The Indian Authorities were holding onto their travel documents refusing to issue them with certificates to fly out the country and The British government done nothing about it….again our men were failed. Billy met his son for the first time when he was 4 months old. He had missed his first cry, his first laugh, he’d missed the sleepless nights and and morning smiles. Billy was still a free man at this point all charges had been quashed. He had the rights of a innocent man to be home where he belonged, yet still his freedom was being denied. We had three weeks of forgetting why we were in India and being a family for the first time. At home in Scotland even the most mundane things I longed to do with Billy and William. I would watch as families walked round the supermarket choosing their weekly shop and wished so hard that it was us. So while in India that’s what we done, it sounds ridiculous but it was one of the best days of my life, we were finally a family and finally together, despite everything that had been thrown at us from every angle imaginable. We made the most of ever last second we had together before we had to leave India and return home…still without Billy. Billy has shown such strength, courage and dignity throughout this whole process. I don’t know how he copes in the archaic conditions of Puzhal Prison but each time I’ve visited he’s painted on a smile, made me laugh when all I want to do is cry and assured me that he is “ok” and not to worry. Even though i can see the sadness and loneliness in his eyes. Not even Billy’s broad Scottish accent can stand in the way or him making lifelong friends while on bail in India. His caring and infectious personality touches everyone he meets and it is what I believe has gotten him through this horrific ordeal. To see the love Billy has for his son stunning and only makes me love him more. Myself and William have travelled to India to see billy three times now but only once has been out with the prison walls. Despite everything, all the time apart and occasions missed William and Billy have the most inspirational of bonds seeing them together only makes me more determined to ensure we bring billy and every last man who was arrested on board the Seaman Guard Ohio home. 4 years on we are no longer fighting for the Chennai6 alone. With over 400,000 people signing our petition we realise just how many people care about the men who lay in that prison cell, without beds, adequate food or even so much as a toilet, not knowing what’s ahead of them. The letters and parcels the men are receiving from friends and strangers are what helps them through the dark days. More and more media outlets are printing the men’s story, taking a interest in both the case and our men not only as innocent prisoners, but as fathers, brothers, husbands and sons. Maritime organisations involved and supporting the men, doing what they can to highlight the injustice and looking into what can be done to prevent this from happening in the future. MPs and Ministers are backing our campaign and many have even flown to India to visit the men in prison and lend their support. The amount of support for our campaign we get now is humbling and provides the fuel we need to carry on when we are running on empty. But its not enough, and never will be. Not until the day every last one of those men walks out of prison and into the arms of their loved ones. I never imagined my life would turn out like this. It’s not exactly the fairy-tale I dreamed of as a little girl. But it has become my fairy-tale. I found my handsome prince, whom I love unconditionally and will fight to the bitter end until he is free and home. We have the most devoted and caring Parents, family and friends anyone could wish for and We have our loving, Clever, Funny and Crazy little little William who came into our lives unexpectedly but at exactly the time I needed him, He keeps me strong, he keeps me smiling and he is my little mini Billy looking after me and keeping me safe, just like his daddy done for me. And one day….hopefully very soon we will get our Happy ever after. Now It’s my turn to fight for Billy, keep him safe look after him and ensure he is released and returned home where he belongs. 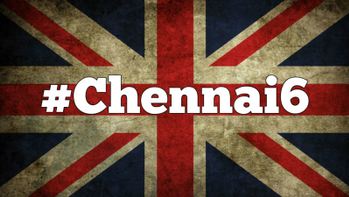 I would urge everybody who follows this blog to contact their MP and demand justice for the Chennai 6 so they can return home to their families once again. This entry was posted in Armed Forces and Military Covenant and tagged #Chennai6, Yvonne Machugh. ← A community victory in Hayes End? I`m Irish and have signed this petition. It doesn’t matter where your from, these boys should be brought home. thanks for sharing. I`m following this now.